I know what it means when a child is a prominent character in a R rated action movie. In the opening 20 minutes of The Predator, we’re introduced to Rory McKenna, a grade schooler on the autism spectrum and son of Army man Quinn McKenna, this film’s protagonist. Can you guess why Rory is here? I groaned out loud, which is okay because I watched this from the comfort of my car at my local drive-in theater. It didn’t get better. 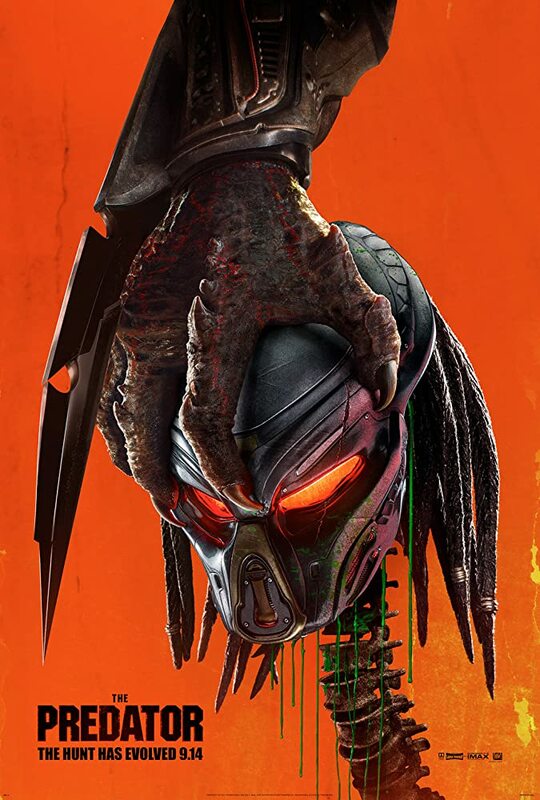 The Predator is a sequel to the previous Predator and Alien vs. Predator movies, starting with a predator crash landing on Earth. After a brief encounter with the senior McKenna, it’s captured by scientists while McKenna tries to escape with some alien equipment stolen from the crash site. McKenna is captured by the government and put with a group of other “crazy” military veterans, but the predator escapes and starts to track down the stolen gear, which McKenna had accidentally sent home and are now in the hands of his pre-teen child. McKenna enlists the help of his new friends and one of the surviving scientists to track down the predator and save his son, but none of them are ready for a second, even more dangerous predator that has also come to Earth. I saw the trailers for this movie and it did not look good. I should have trusted my instincts. The gaggle of damaged military veterans are obviously made to emulate the special forces team of the first Predator, except they somehow have even less dimension to their characters, and essentially no motivation to take on this suicide mission. McKenna’s motivations are so incredibly weak as well, mostly correcting for a problem he caused for himself by stealing alien artifacts for seemingly no reason. But the worst of these are the motivations of the first predator that crash landed on Earth. Without spoiling the weak plot, the reason for why the first predator is on Earth to begin with is nonsense, especially in context of its actions. The only character that makes any sense whatsoever is the super predator but even its actions can’t be reconciled with its motives at times. The ending is completely predictable, and how they get there requires so much hand waving and movie magic that it pulled me completely out of its fiction. This movie world does not make sense, and not in a whimsical way, just a thoughtless way. I cannot believe a single thought went into this script beyond the singular purpose of getting from one end of the movie to the other. Even if it made sense, it’s a bad action movie. For unknown reasons, the whole movie takes place at night (with a questionable amount of fast forwarding through time at the start), and nearly every scene is poorly lit. This is good for the predators though, because they don’t seem to take much advantage of the benefits of being a predator, namely being able to hunt invisibly. You see so much of these predators that they may as well be slasher movie villains. This is Predator by way of Friday the 13th. No skilled hunters, just invincible killers brutally murdering anyone in the path of their (again, weak and nonsensical) mission until the plot dictates that they have to be defeated. I don’t hold any franchise sacred, but this is worse than just a bad popcorn action movie. It belongs in the gutters with Terminator 3, Terminator: Genesys, and Alien: Resurrection. This is a movie so bad that it should put the franchise on the shelf for a very long time. I don’t want to see someone course-correct on this. Please, Fox/Disney, put Predator away and let us forget this horrible outing.